Mix all vegetable dip ingredients in a bowl. Stir until smooth. Store the vegetable dip in a small container in the refrigerator until ready to serve. Let’s just make it easy today and get the frozen bread dough out of the freezer section at the grocery store. 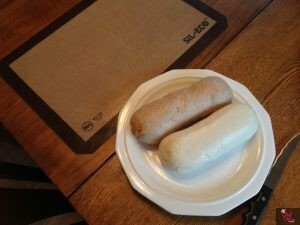 Choose the packages of either white or wheat containing the 1 pound loaves. 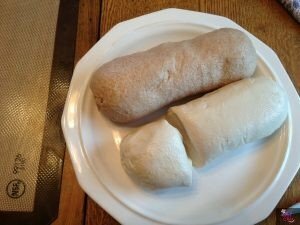 Thaw 2 loaves (1 pound each) of bread while covered with a clean, damp kitchen towel. To one of the thawed loaves of bread dough, cut about ¼ off the dough. Roll the freshly cut piece into a ball and flatten slightly. This will be the bunny’s head. Place the head on a non-stick prepared baking pan. To the remaining ¾ section of the dough, roll it into a ball and then flatten until the dough is shaped into an oval about 6 inches across and 7 inches long. This is the bunny’s body. When placing on the prepared baking sheet, overlap the head and body slightly and pinch together. To the second loaf of bread dough, divide the dough into four equal sections and roll into balls. Roll 2 of the newly created balls into long, equal length ropes (about 14 inches long or so) and fold each rope in half. These are the bunny’s ears. Place ears at the top of the head and pinch to the head. Using the third quarter section of dough, split this section into 2 equal sized portions and roll each into a ball. These are the bunny’s hindquarters. Place these balls at the bottom of the bunny’s tummy for feet and slice with a knife to make it look like toes. 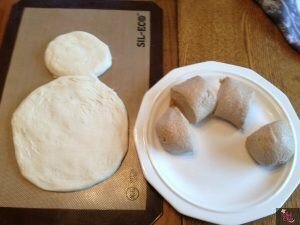 Divide the last portion of bread dough into 3 equal sized pieces. Roll 2 of the pieces into balls. These are the bunny’s front paws. Place paws at the top of the tummy and on each side. 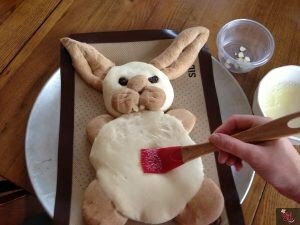 To the last ball remaining, cut off ¼ of this dough for the bunny’s nose. Divide the rest of the remaining dough into 2 equal portions and roll into balls. This will be the bunny’s mouth. Place at the bottom of the head next to each other, with the nose just above the mouth parts. Slice whiskers into the sides of the mouth. Place dried cherries or raisins or cranberries above the nose where the eyes should be. 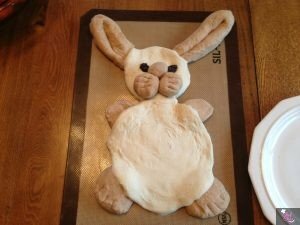 Allow bunny-shaped dough to rise for an hour while covered with a damp towel. 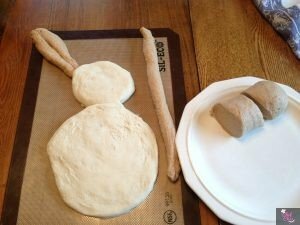 When bunny dough has had a chance to rise, generously coat with egg wash (1 egg white plus 1 Tablespoon water). Bake in a preheated 350 degree oven for 30 minutes. 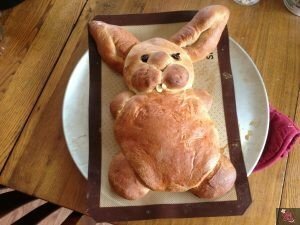 Remove bunny from oven when a toasty brown. Set aside to cool on a wire rack. 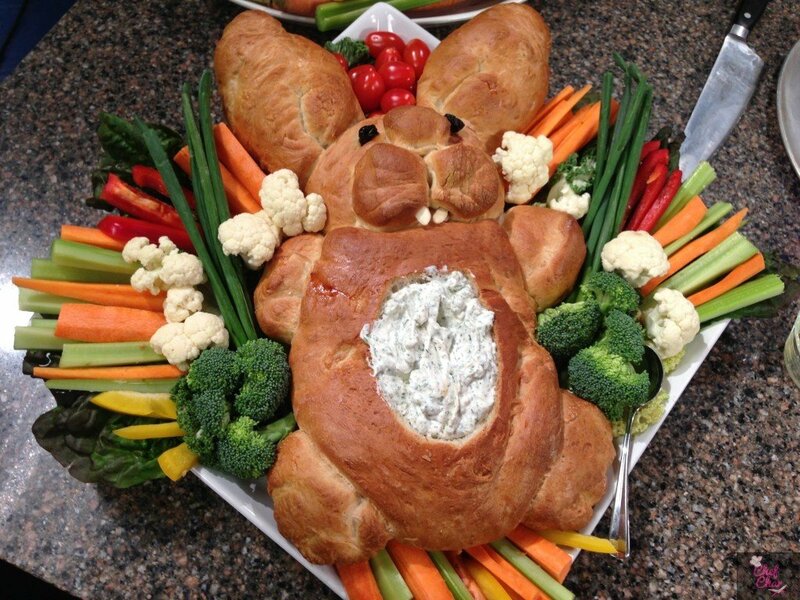 Place bread bunny on a large platter. 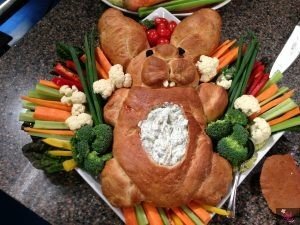 Surround bunny with lettuce, kale and fresh vegetables for dipping. 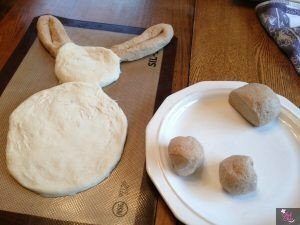 Cut out and remove a large circle on the bunny’s belly and fill with vegetable dip.